Over two days at the beginning of February, the D4R marketing team hit Munich for an exploration of ISPO at Munich’s Messe! 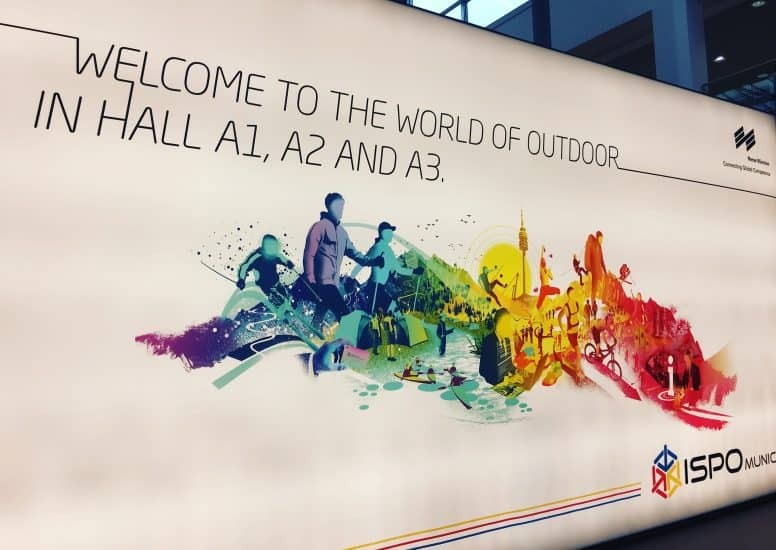 ISPO is an energetic outdoor sports trade show, providing visitors with a comprehensive platform to learn about the latest in sports trends; including innovation, textiles, and equipment. From more established companies with larger stands through to more recent start-ups looking for distributors, the show is packed with a variety of enthusiastic brands. Every stand presented something different to visitors, but most offered coffee, beer & snacks as part of the really relaxed and inviting vibe that ISPO maintained. Conference spaces were open and easily accessible, with information on the latest wearables, retail design trends and colour predictions for 2018. During our time, we took plenty of photographs of some fantastic stands and rallied together to create a top 5 list. We thought we’d share that list with you! 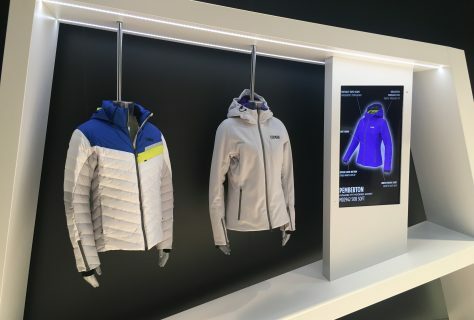 The main detail we noticed about Jack Wolfskin’s stand at ISPO was its immensity. Covering possibly the largest square footage at the show, it almost felt as if we had entered a store rather than a stand. In the middle, the brand had an entire space reserved for presentations with enough room for 50+ visitors. 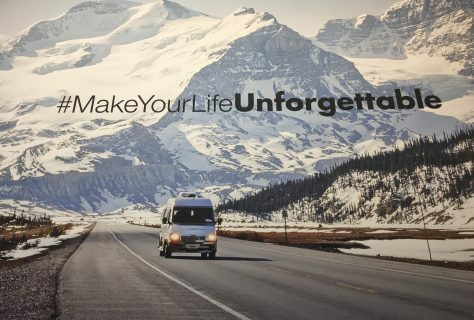 Large scale graphics adorned the stand with their infamous hashtag #MakeYourLifeUnforgettable making a statement also. 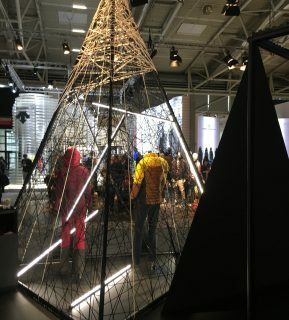 The stand appeared to incorporate several trends from the show; including natural wood materials, floating products, strong triangular shapes, and bold graphics. We award JW the best in show purely due to its all-encompassing nature and bold presence. Our second choice in the top five list must be Black Yak. From the outset, the stand caught our eye with dominant pyramids encased in rope-like material and filled with tube lighting. 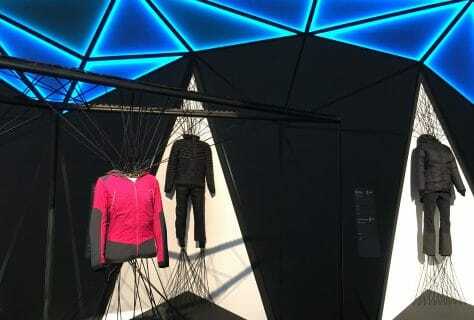 The brand’s latest gear was suspended with criss-crossing ropes and above them, blue triangular lighting slowly faded in and out; both design elements appealing to an extra-terrestrial or futuristic theme. With all the talk regarding the future of technology + wearables at ISPO 2017, Colmar focused on this trend with their futurist stand. Their space almost echoed the design of a spacecraft, with brand members wearing silver skirts and futuristic make-up. Numerous screens detailed the latest gear and the wall was adorned with grey hexagons filled with statements such as innovative, futurist and technical. 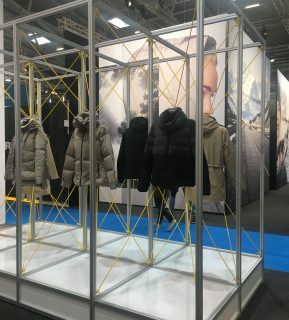 Bang on trend at ISPO 2017 was Berg with their use of sustainable and ethical materials. Amongst a hall filled with high-tech screens, bold graphics and bright colours; Berg focused on the naturalism of a forest for their stand. 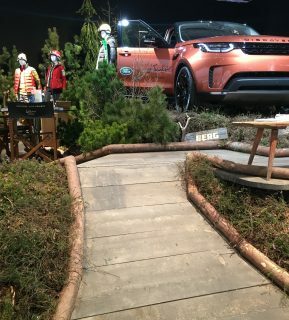 The stand caught our eye with its Nordic trees, wooden flooring and burnt orange Range Rover. An established + reputable brand, Canada Goose offered minimalism when it came to stand design. 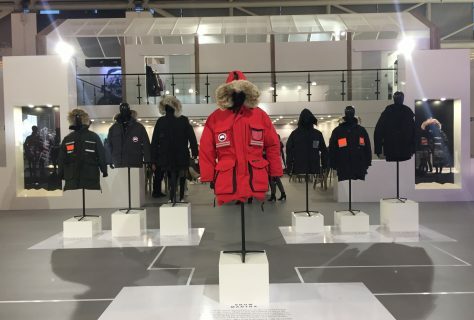 Amongst the bright + energetic design of many stands, Canada Goose was muted but effective with their use of white + grey. 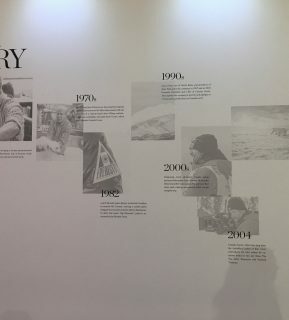 A timeline wall depicted the story of the brand and a motivational quote could be found towards the back, in the more privatised area for admirers of the brand. Shape + form was a hard-hitting trend this year with the bold, triangular and hexagonal shapes dominating most stands in various forms. As we look towards outdoor sports trends of 2017, we expect to see this shape taking form in many stores across the globe; perhaps utilising futuristic themes. 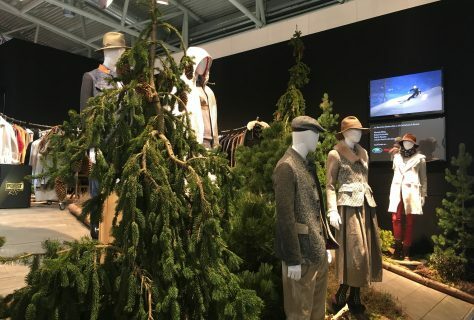 An important aspect of this is also material, and ISPO 2017 highlighted the importance of sustainability with wood, rope and greenery overshadowing metals. 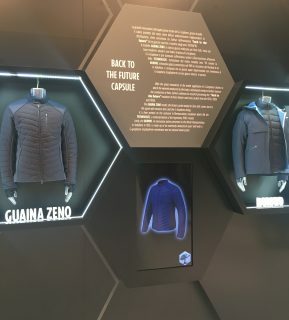 However, shape, colour + graphics weren’t the only consideration for brands at ISPO as they strived to incorporate technology + immersive experiences into their stands. From virtual reality + photo booths through to digital screens, nearly every brand presented their own version of digital media; an important trend to join forces with as wearable technology maintained its popularity in outdoor sports.